It’s been a rough time for Grab these days. Receiving huge waves of rants from its users, Grab did everything it could, including its 100-day campaign, to improve its ride-hailing service in the country. Also, the company explained the unmet demand and supply to the riding public. However, Grab shifted its focus, as it looks for good things to celebrate. Hence, the brand held its Papugay Awards that eye to acknowledge Grab Drivers who go beyond their road responsibilities. The primary role of a Grab Driver is to bring its passenger conveniently and safely from point A to point B. While we’re all used to see a typical polite drivers, many “Manila’s Road Rockstars” take their job to the next level by going beyond their transport jobs. “The Grab ride-hailing platform is at the forefront of interface technology, and as you book your ride through the app, our drivers become the frontliners of the service. We value our drivers as they are instrumental in changing the TNVS industry, and they are at the core of our commitment to improve and consistently offer high-quality experiences to our passengers,” Cindy Toh, Grab Philipines Country Marketing Head, addressed. 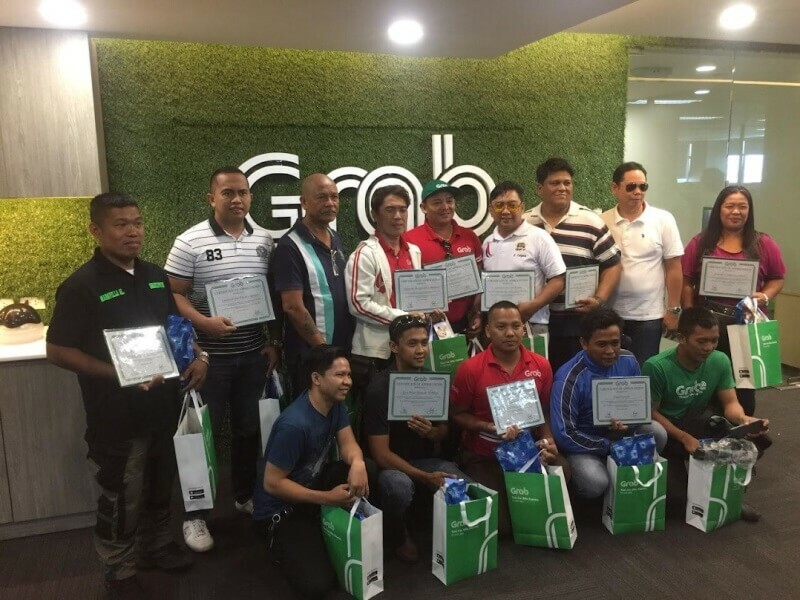 Last Labor Day, Grab Philippines held its Papugay Awards to celebrate Grab Delivery, Grab Taxi, and Grab Car drivers who have the most 5-star ratings. On that note, Grab invited the acknowledged Grab partners to receive their service awards in a simple ceremony. For Grab Delivery drivers, the awardees include Ahdan Guzman and Sandro Lozano, who both made good impressions and extra effort to their customers. On the other hand, Jimmy Orpilla Jr. and Antonio Maravilla give fast delivery while making their customers satisfied. Honest driver Oniel Edoria was mistakenly paid Php500 instead of Php50, yet he promptly informed the customer, too. Meanwhile, Grab Taxi Drivers list includes Luisito Santos, who has been tagged as Tatay Luisito; the very accommodating and helpful Renato Meneses Mangalinda, who take passengers on the fastest and shortest routes; the bubbly Pedro Desucatan whose passengers constantly comment on how happy they are on his trip; Edgardo Mangubat Casimsiman who is applauded for his patience; and Victor Gernale, a hero of the day for a passenger who was about to miss his flight. Moving on to Grab Car Drivers, Grab was able to share more heartwarming stories. First is Jovelton Almonte Lopez, who is generous enough to its passengers to offer water, candies, tissue, and crackers. Also recognized was Normando De Borja Cruz, who did not accept extra fares from passengers, saying that he was only doing his duty even on heavy road days. Both Ronald Cachapero Santos and Jose Rizal Aceverdo Matacot were commended for being kind. Ronald helped lifting a passenger’s half-paralyzed mother on and off his vehicle, while Jose did not take the fare from a passenger who’s bring her aunt to the hospital. In addition, Michael De Jose De Pedro gave a free ride after he learned that its passenger were transporting a bag of blood from the Red Cross for its mother’s transfusion. Also, Emerson Del Rosario did not charge its passenger's fare when it told him that it has leukemia. Last but not the least, 63-year-old Romualdo Salvo Alabarca picked up his passenger on his way home to Molino, and aside from giving a free ride, they also picked up passengers who were stranded along the way. After all, there are still good things happening on Grab on top of its current situation. On that note, do you have Grab stories you want to share? Let us know how your Grab driver has helped you enjoy your trip by sending a message to the official GrabPH Facebook page.